Are you a top talent with strong leadership qualities and a passion for doing business? Are you looking for an exciting career within a value-driven, global retail company? 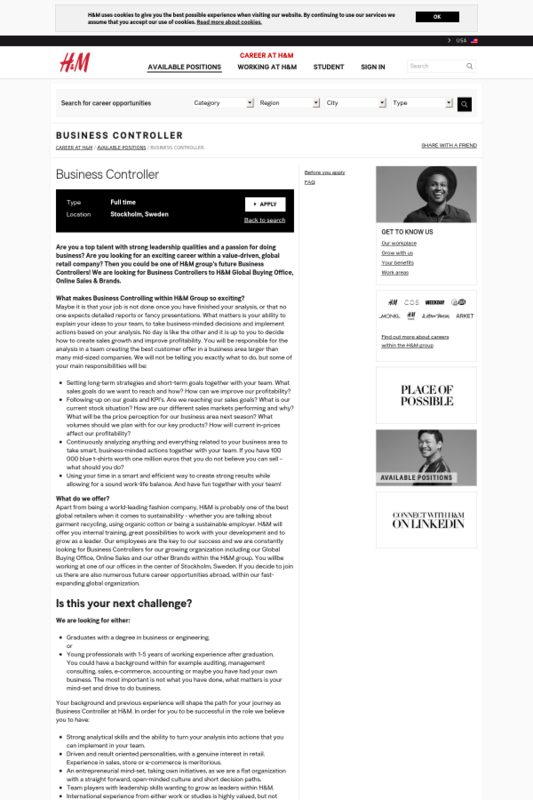 Then you could be one of H&M group’s future Business Controllers! We are looking for Business Controllers to H&M Global Buying Office, Online Sales & Brands. What makes Business Controlling within H&M Group so exciting? Setting long-term strategies and short-term goals together with your team. What sales goals do we want to reach and how? How can we improve our profitability? Following-up on our goals and KPI’s. Are we reaching our sales goals? What is our current stock situation? How are our different sales markets performing and why? What will be the price perception for our business area next season? What volumes should we plan with for our key products? How will current in-prices affect our profitability? Continuously analyzing anything and everything related to your business area to take smart, business-minded actions together with your team. If you have 100 000 blue t-shirts worth one million euros that you do not believe you can sell – what should you do? Using your time in a smart and efficient way to create strong results while allowing for a sound work-life balance. And have fun together with your team! Apart from being a world-leading fashion company, H&M is probably one of the best global retailers when it comes to sustainability - whether you are talking about garment recycling, using organic cotton or being a sustainable employer. H&M will offer you internal training, great possibilities to work with your development and to grow as a leader. Our employees are the key to our success and we are constantly looking for Business Controllers for our growing organization including our Global Buying Office, Online Sales and our other Brands within the H&M group. You willbe working at one of our offices in the center of Stockholm, Sweden. If you decide to join us there are also numerous future career opportunities abroad, within our fast-expanding global organization. Graduates with a degree in business or engineering. Young professionals with 1-5 years of working experience after graduation. You could have a background within for example auditing, management consulting, sales, e-commerce, accounting or maybe you have had your own business. The most important is not what you have done, what matters is your mind-set and drive to do business. Strong analytical skills and the ability to turn your analysis into actions that you can implement in your team. Driven and result oriented personalities, with a genuine interest in retail. Experience in sales, store or e-commerce is meritorious. An entrepreneurial mind-set, taking own initiatives, as we are a flat organization with a straight forward, open-minded culture and short decision paths. Team players with leadership skills wanting to grow as leaders within H&M. International experience from either work or studies is highly valued, but not mandatory. Fluency in English is required – Swedish is not mandatory. Please send your application in English including CV, cover letter, high school and university grades and let us know why you want to be a part of a growing, global retail company and how you can contribute to increasing sales and profitability. Selected candidates will be given analytical web-tests as a first step and then a telephone interview. If we believe you have what it takes, you will be invited to an interview day at our Head Office in Stockholm. H&M is a world-leading fashion company, with more than 161.000 employees, 4700 stores in over 69 markets and over 43 online-markets. H&M group also includes COS, Weekday, Monki, Cheap Monday, ARKET, &Other Stories and H&M Home. Our business idea is "Fashion and quality at the best price in a sustainable way".